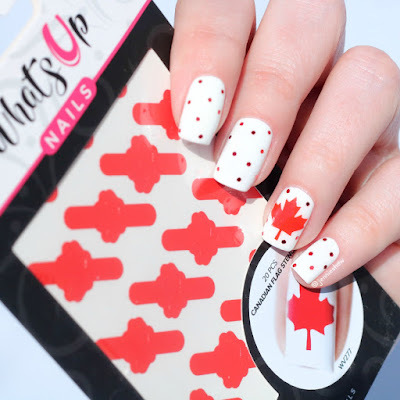 jennie's nails and tales: canadian nail stencil giveaway! Living in the country, it can be a challenge to get my paws on professional nail products, which is why I've been a long-time customer of Nail Polish Canada. Their selection of piCture pOlish, China Glaze, ORLY, and nail art tools is pretty incredible, and they host a few nail art comps throughout the year, which I always love to enter. 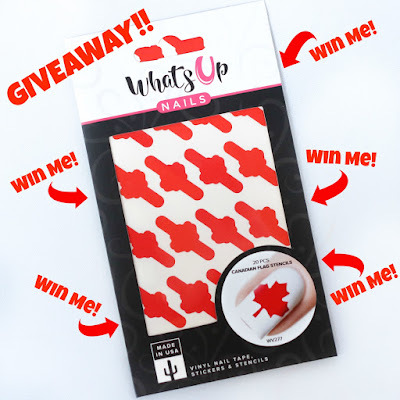 And now, I'm an even bigger fan of the greatest Canadian nail polish website because they're giving away free nail stencils!! 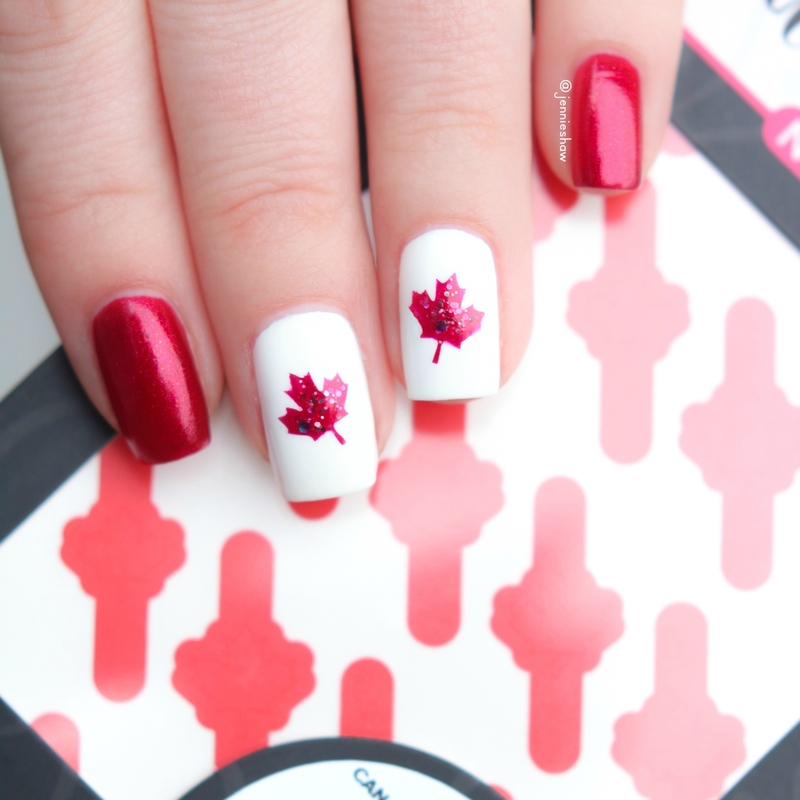 Yes, in honour of Canada's 150th year of being awesome, Nail Polish Canada is helping fellow Canucks celebrate by having festive, maple leaf nails. They aren't just any old stencils, though. Nope, they're from the company I trust the most when it comes to nail vinyls. Obviously, I'm talking about What's Up Nails. Today, June 14th, bloggers across the country are posting codes and the first 10 people to use each blogger's specific code will snag themselves a sheet of 20 Canadian flag stencils. Each set has two different sizes of leaves, which can be used in two ways. I did a couple of manis so you can see what I mean. First, for those who may not have an extensive polish collection, or are nervous about using a stencil, you can use the centre sticker. Just place it on your nail, add a topcoat, and you're good to go! The vinyls are much thinner than traditional stickers, so you won't be left with a hard edge that can peel. White base is Fingerpaints Paper Mâché. Loose, red hex glitter is from Amazon. The second option is to use the stencils themselves, with the polish colour of your choice. What's Up Nails stencils bleed the least, but even so, it's important to remove the stencil as quickly as possible to achieve a crisp outline. Wait until the polish is totally dry and then add a topcoat to smooth out the surface. White base is Fingerpaints Paper Mâché, Red is China Glaze Peppermint To Be, and the glitter is China Glaze Ugly Sweater Party. This deal even includes shipping so what the heck are you waiting for? Thanks so much to Nail Polish Canada for hosting such a fun giveaway!! Hey, guess who got the free nail decals! Thanks so much for the awesome giveaway, can't wait to use them on Canada Day!